KID museum hosted Girl Power Day on March 24th in Bethesda, MD. Volunteers from Young Women In Bio (YWIB) – Capital Region participated in the event as STEM experts to engage in informal sessions with the girls and their families. Young Women In Bio hosted hands-on activities in Neuroscience Section. The activities are (i) muscle spiker activity with electrodes to measure the activity of your muscles in response to movement, (ii) brain hat activity to color different parts of the brain and make a colorful hat to take home and (iii) brain anatomy model. Volunteers from YWIB spearheaded the brain anatomy model activity. Each girl was provided with a disassembled brain model. With the guidance of the volunteer, the girls learned the different parts of the brain and its functions as they build the model. The volunteers also engaged in conversations with the parents to provide insights about the fundamentals of the brain and brain disorders. Our conversations were well-received by the parents. YWIB Capital region would like to thank KID museum for hosting the event, Claire Cocciole, Director of Maker and Community Partnerships for organizing the event with YWIB and our volunteers who came to support our event and helped make the event a success. Read more about the highlights of the event. 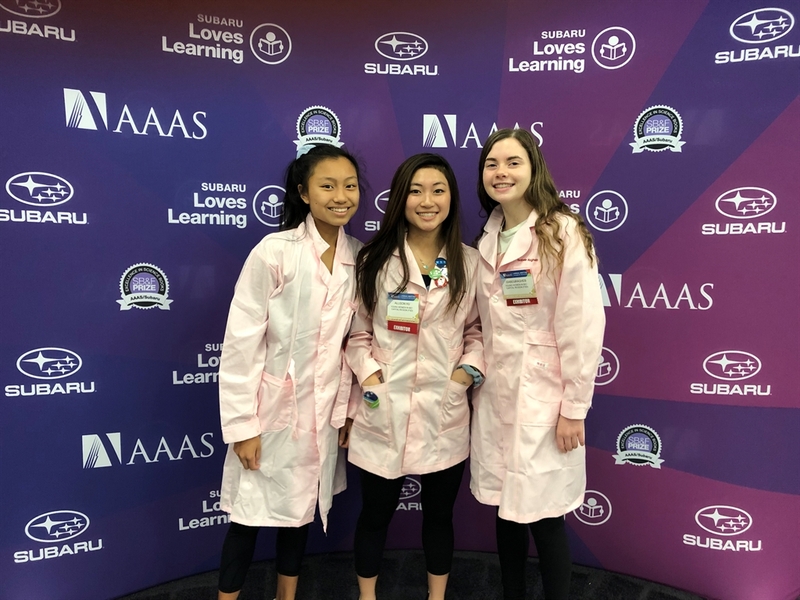 American Association for Advancement of Science (AAAS) Family Science Days occurred on February 16th and 17th in Washington D.C. Family Science Days is a free public event that offers hands-on, kid-friendly activities. The event ran from 11:00 a.m. to 4:00 p.m. on both days with over 3150 guests in attendance. Young Women In Bio (YWIB) participated in the event as an exhibitor for both the days. Young women who are high school students from Montgomery County public school system performed the demonstrations and activities for YWIB. YWIB had two hands-on activities. The first activity consisted of identifying different organs and building a human anatomy model, while the other activity involved making an edible DNA helix using pieces of candy. In the first activity, each child was given a disassembled human torso model. With the help of YWIB volunteers, the children learned the functions of each organ as they assembled the model. Upon completion, each participant was allowed to spin a wheel to claim their prize. The prizes included rock candy, a lollipop, or a YWIB sticker. Approximately 500-600 children participated in this activity. For the second activity, each child was given a packet comprised of Twizzlers, Gummy Bears, marshmallows, and toothpicks. With the help of volunteers, each participant made a DNA helix while learning about the composition of DNA – phosphate group, bases, hydrogen bonds, and sugar. Upon completion of the activity, participants could eat their edible DNA helix. Approximately 175 children participated in this event. YWIB Capital Region had a great turn out for the event, and our activities were well-received by the attendees. One young man who participated in the edible DNA helix activity stated that “it was more fun and engaging than he had anticipated”. YWIB Capital Region would like to thank the event organizer, Ms. Stacey Baker, AAAS, and the event sponsors – Analog Devices Inc, Bristol-Myers Squibb and Subaru for sponsoring the 2019 Family Science Days. We also would like to thank our YWIB volunteers and high school students who carved out time to support us over the weekend, and helped make the event a success. 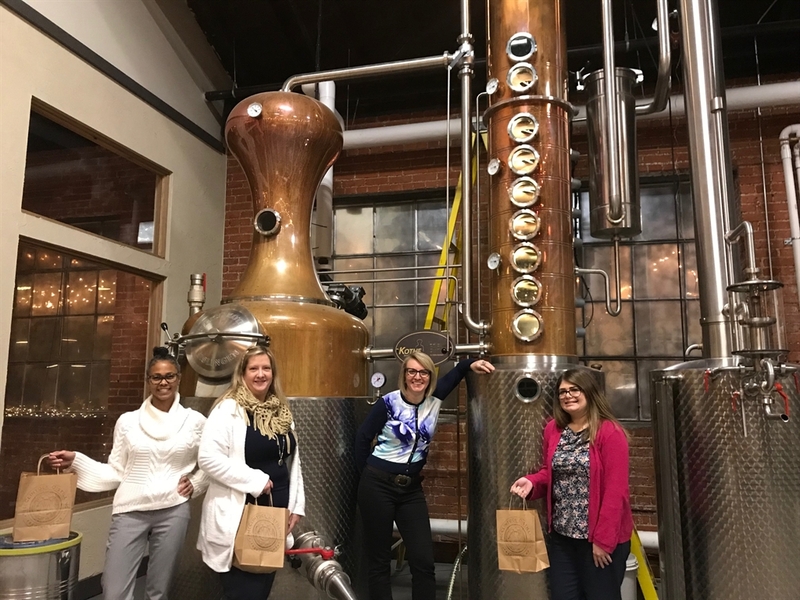 Thanks to effective collaboration with one of the community partners in Frederick, our MAPS members were given a unique opportunity to conduct our monthly MAPS meeting at McClintock, a locally owned gin distillery. Kelly Beazley led and activity based on Lean In curriculum. Surrounded by the aromatic fumes of freshly infused gin, our members engaged in vibrant discussion regarding how we can capitalize on our strengths, activities that energize us, and manage our weaknesses, activities that drain us.Each member created an action plan to start leveraging one of the strengths and neutralize one weakness. We concluded our evening by tasting an insanely delicious Spiced Pear Cordial. We would love to thank McClinctock’s owner, Mr. Braeden Bumpers, for his generosity and for making our MAPS evening so magical.